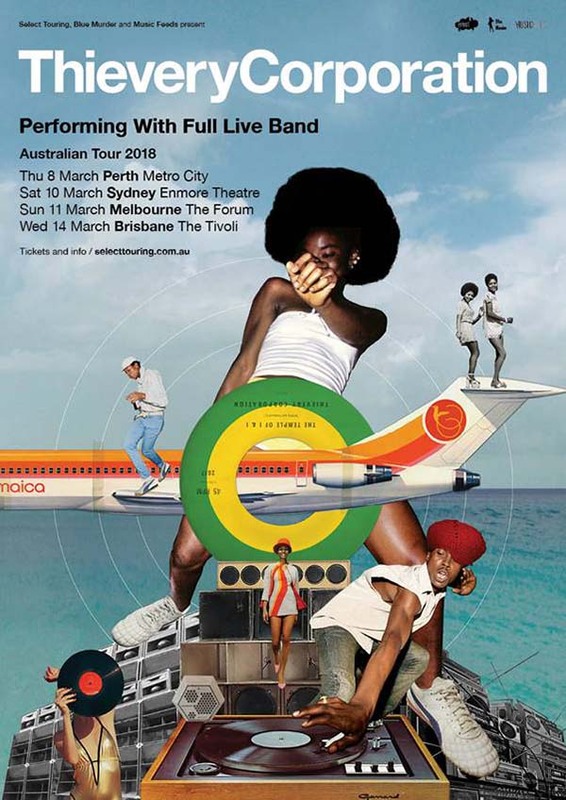 Get ready to be drawn into the smooth, evocative and eclectic sounds of electronic duo Thievery Corporation as they return to Australia performing with a Full Live Band! Bonding over their shared passion for Bossa Nova, Eric Hilton and Rob Garza of Thievery Corporation have spent over two decades crafting their own archetype of electronic music that draws influences from Jamaican Dub, Afro-Beat, trip hop, acid Jazz, Middle Eastern, Indian, New York Tones music and more. Thievery Corporation established a unique and hypnotic aural trademark that would go on to influence a generation of producers and DJ’s to follow suit. They’ve since sold millions of records, have headlined major music festivals such as Coachella and Lollapalloza, collaborated with unique famed artists Perry Farrell, The Flaming Lips and David Byrne and remain one of the genre’s most revered acts as they continue to tour the world two decades on. Whilst Thievery Corporation’s 2014 release Saudade payed tribute to their Bossa Nova inspirations, members Hilton and Garza delve deeper into the warm spirit of Jamaica in their latest studio album The Temple of I & I. The album features reggae rhythms intertwined with psychedelic dub moments that serve to demonstrate that Thievery Corporation’s ability to effortlessly bend genre boundaries. Having sold out their previous Australian tour, don’t miss Thievery Corporation as they transcend genres and take us on a sonic exploration through the sounds of the world for an energetic and eclectic evening.